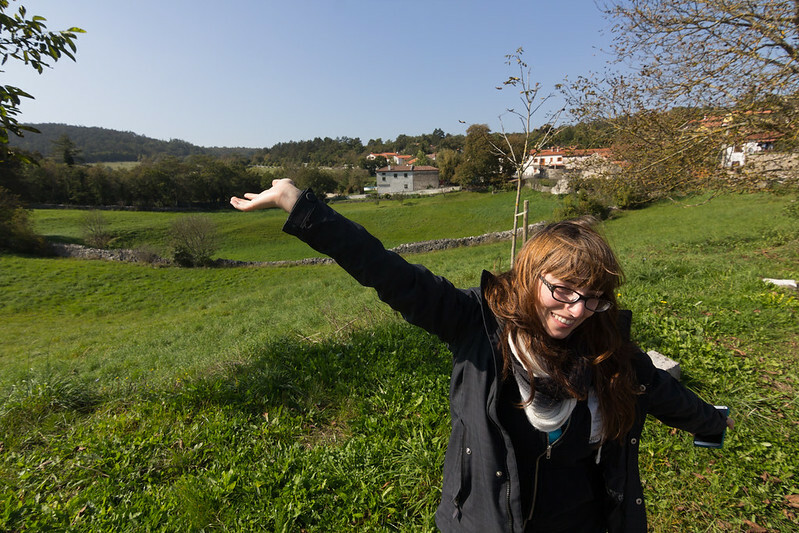 Finished with Croatia, we continued onto the neighboring country of Slovenia. Sharing a past that had both Slovenia and Croatia as part of a much larger Yugoslavia, Slovenia is now independent and a member of the EU. We were quickly finding out that these countries all shared a common trait: water. They all have a lot of water and water-related geography. After another passport checkpoint from Croatia, as Croatia was not fully a part of the integrated EU travel zone, we were back on the road in the very similar Slovenia. 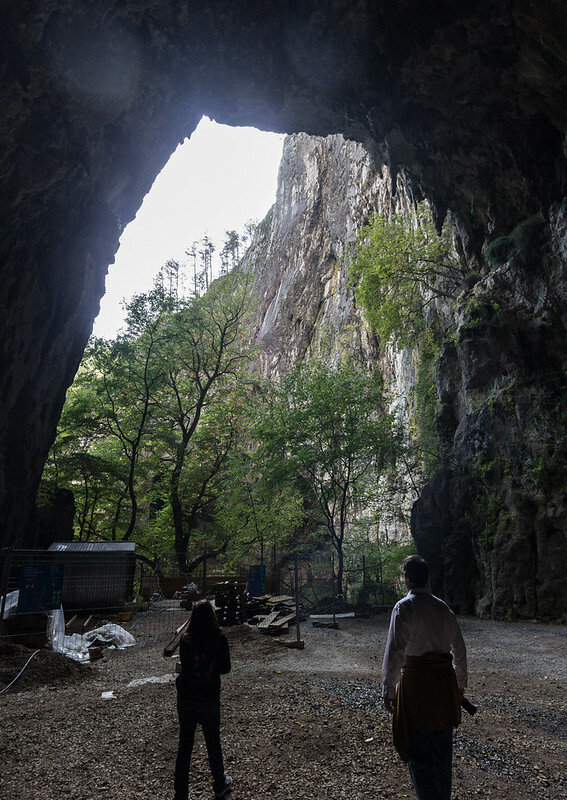 Our first stop was at the Škocjan Caves, which are a UNESCO site featuring an astoundingly large underground canyon. As with all cave visits, the entrance was understated: we walked down a hill from the ticket booth through a farm until reaching a concrete bunker and tunnel. Bored by the Italians, the tunnel placed us in the “dry” part of the caves. The river didn’t go through this section, and the large caverns were eroded in place over countless millennia. Disconcertingly, our guide pointed out the debris of a collapsed ceiling all over one of the largest “rooms” before noting that the back of our ticket explained that the cost included a life insurance policy. As we continued downwards into the cave system, a faint roar became noticeable: which quickly erupted into a full-fledged raucous of a river as we rounded the bend and were greeted with an astoundingly large underground cavern before us, and a river cutting through the landscape far below. The path followed along the walls of the cavern, and at one point featured a bridge spanning the river. If you glanced under your feet, you could see the water churning through a few hundred feet below. The “wet” part of the caves were very Lord of the Rings in that they resembled what I pictured the mines of Moria to be like. All along the great canyon, small catwalks and makeshift bridges dotted the landscape: paths created by explorers over the past hundred years, and still used today by researchers. Even more striking were the older tourism infrastructure. Originally a path was carved from the stone much closer to the river, but the frequent floods caused the new path to be created and the older one to be largely abandoned. What reminds are stone steps winding their ways through the cave. After the caves, we stopped for some quick wine and cheese at a Slovenian village. Continuing into the country, we arrived at Lake Bled. If you picture an European mountain lake, something like Bled comes to mind. Oval shaped, the lake has a small island in the center featuring a church, and watching the entire lake and town was Bled Castle on an imposing cliff. Bled had the vacation house of Tito, so there’s that going for it. It’s a large hotel now that still keeps the Communist murals on the walls and available for history-minded tourists to see. The lake doesn’t allow motorized boats, and the waters are mostly plied by keel-less boats piloted by a single rower. The boatmen often build their own boats, and the profession is passed down from father to son. It’s an impressive sight to see someone row and steer 26 people on a single boat, while standing the entire time. The organized part of the tour ended in Bled, and we were excited to strike out fully independent once again. Although the tour only occupied around 50% of our time, we were ready to go back to the kind of travelling we were used to. Grabbing a local bus, we were a few hours away from the capitol city of Slovenia: Ljubljana. We also became experts at pronouncing this name. Our hostel for the night was a former prison, and 20 of the rooms were converted jail cells: each with its own unique decoration and layout by a local artist. 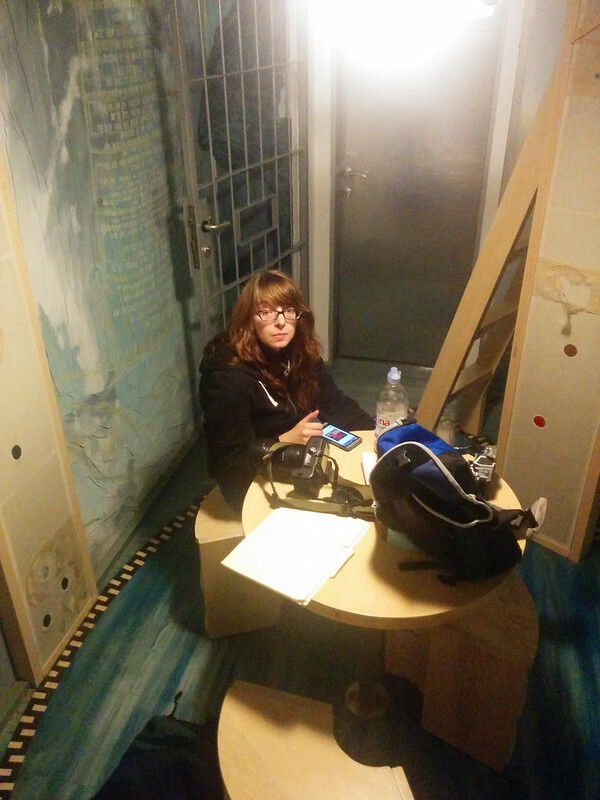 Our room was, well, jail-like. There were two doors in all of the former cells: the outer traditional solid door, and an inner jail door. 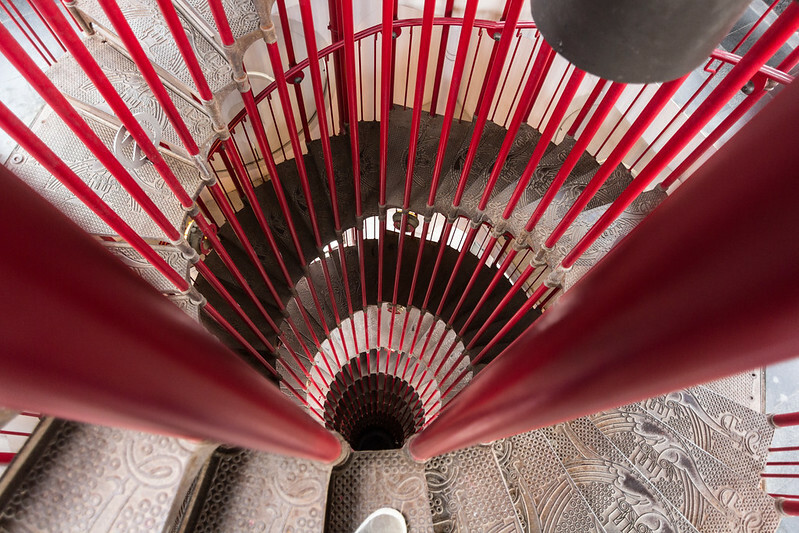 They did tours of the hostel every day, and if you didn’t mind people seeing your cell, you could leave the outer solid door unlocked so that they could peek in through the cell door. Ljubljana was a very impressive city while retaining a very distinct architectural style. Ljubljana, has a–you guessed it–castle in the center of town, and they worked hard to keep it culturally relevant while still retaining its historic value. A town symbol was a dragon, and you saw it pop up everywhere. The castle had lots of very tall spiral staircases. Note the stylized dragon in the steps. Ljubljana at the top of the castle. We ate a lot of pizza on this trip. Why? Because this region is influenced by the Italians, and they made excellent pizza. The pie shown above was the second best pizza I’ve ever had the pleasure of eating: second only to that find in Naples. 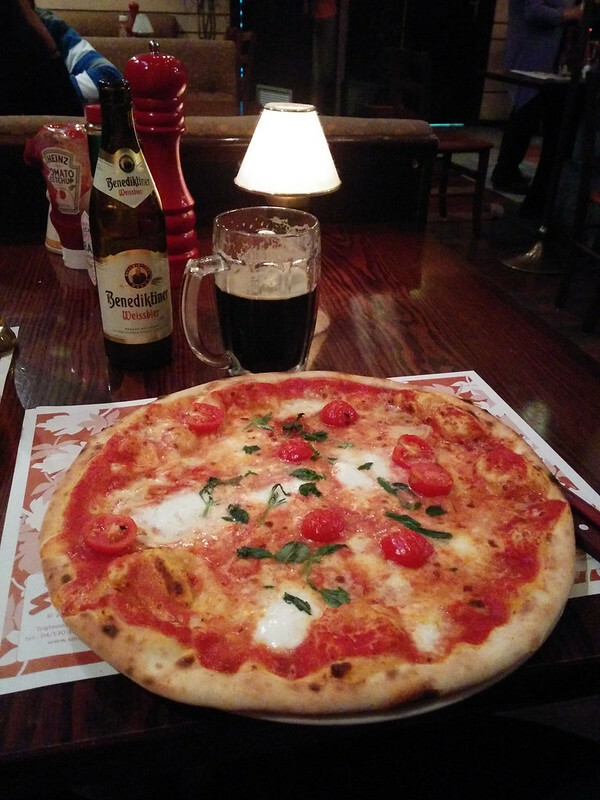 The meal was finished off nicely with a very large local dark beer. 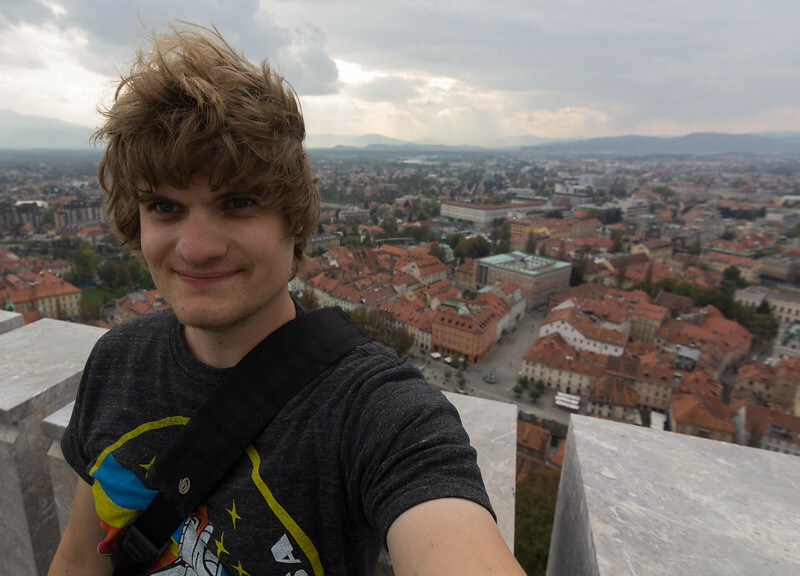 After a short 1-night stay in Ljubljana, we were off to Munich! Booked in a through carriage, our train car changed trains in Austria, but we didn’t have to transfer. They did the transferring for us by detaching and moving the entire carriage. 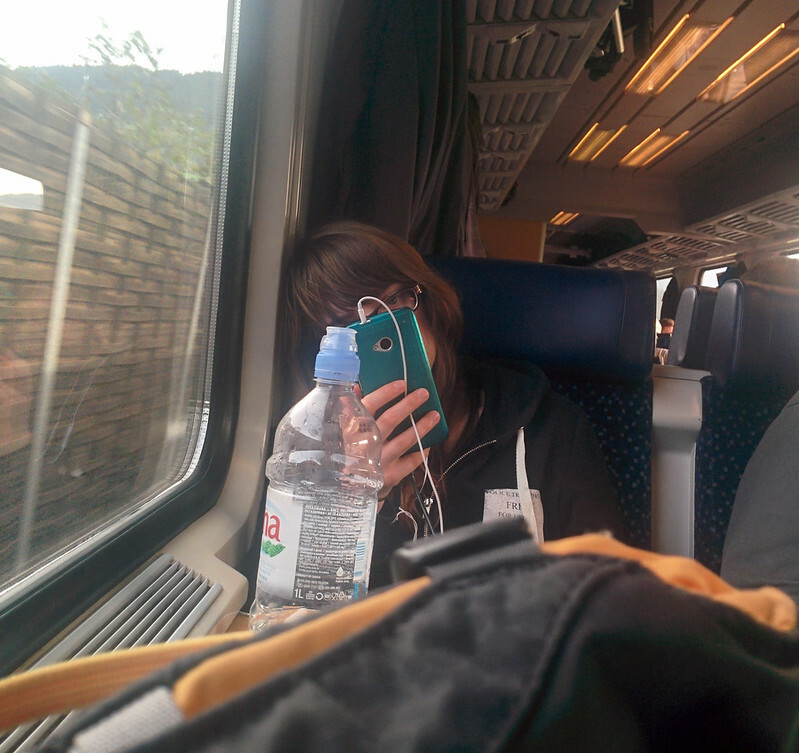 The train trip was super, uh, interesting, as we’ll explore in the next entry: Germany!